Ann Kitchen chairs City of Austin Mobility Committee meeting of June 14th. Photo: Sceenshot from ATXN video. 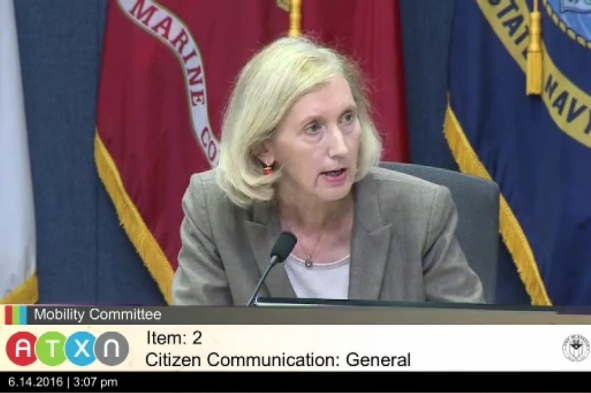 The following comments were made during Citizen Communications to a public meeting of the City of Austin’s Mobility Committee on 14 June 2016. Lyndon Henry is a transportsation planning consultant, a former board member of Capital Metro, a technical consultant to the Light Rail Now Project, and a contributing editor to this website. I urge you to include a measure for urban rail in the proposed $720 million “mobility” bond package now under consideration. 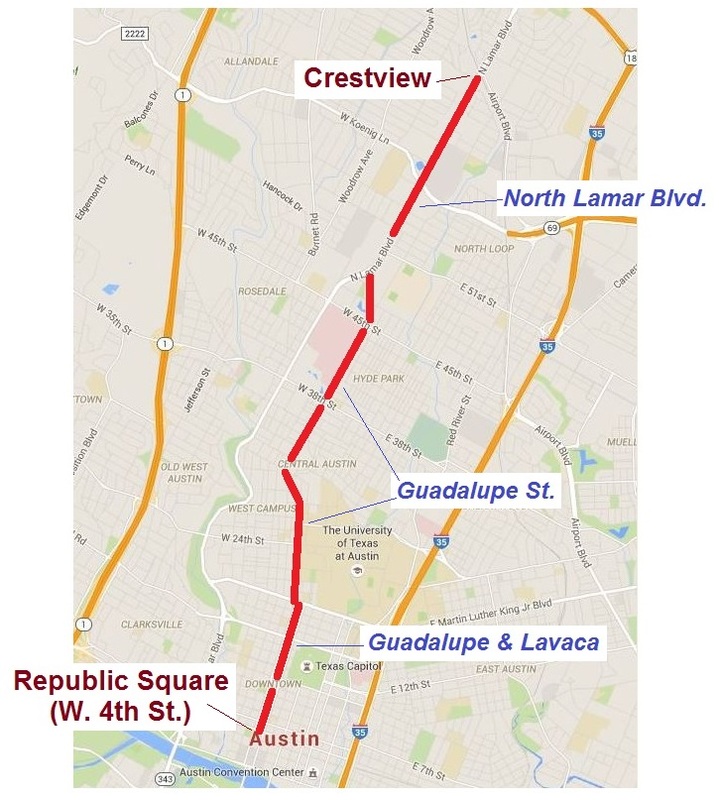 I support the proposal for an affordable 5.3-mile light rail Minimum Operable Segment on North Lamar and Guadalupe from Crestview to downtown. Currently 83% of the proposed $720 million package is devoted to road projects. Surely some of these road projects could be replaced with the $260 million to $400 million that would facilitate an urban rail project. Proposed 5.3-mile light rail transit starter line Minimum Operable Segment in Guadaluoe-Lamar corridor. Graphic: CACDC. It’s absurd that the $720 million bond package you’re considering could be labeled a “mobility” package despite NO major initiative for transit, let alone urban rail, which has been studied and affirmed as a necessity for decades. This bond proposal stands in contradiction to the decades of official “green” rhetoric and policy initiatives such as Envision Central Texas and Imagine Austin that have verbally embraced public transportation and “high-capacity transit” as key “alternative mobility” measures necessary to “keep Austin moving”. This road-focused $720 million package tries to address congestion by increasing “throughput” of vehicles. Unfortunately, experience and evidence suggest that this is a losing approach — trying to tweak more capacity to squeeze through more cars typically just induces more traffic. Furthermore, this influx of ever-growing vehicle traffic imposes more stress on congested areas such as Austin’s core. 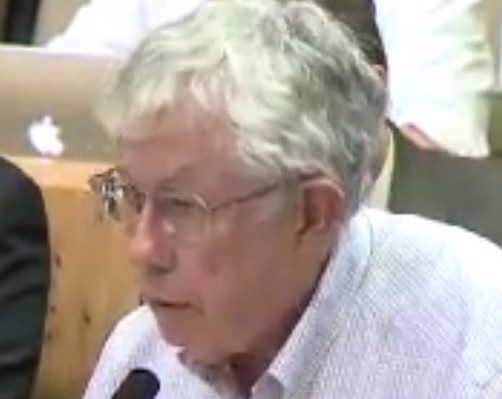 Lyndon Henry presenting comments to City of Austin Mobility Committee on June 14th. Photo: Screenshot from ATXN video. 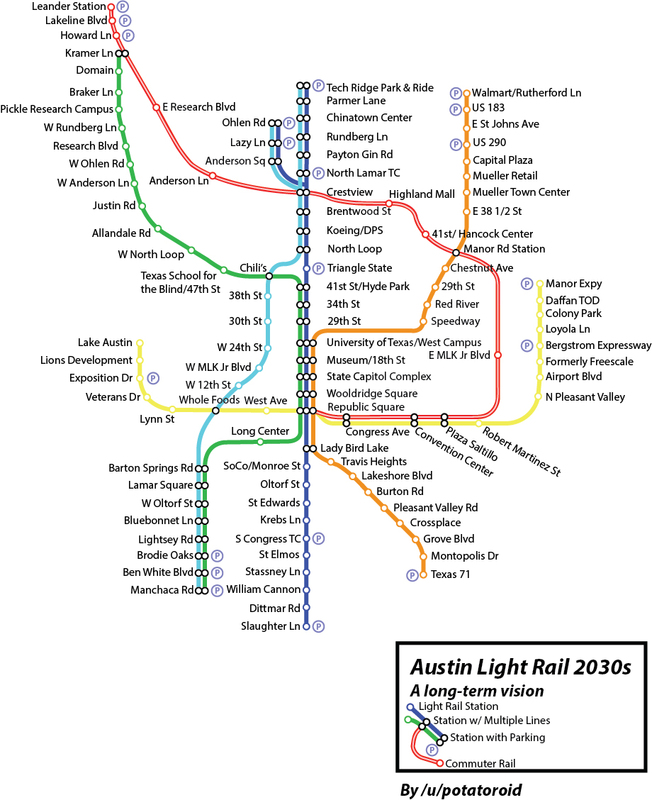 In contrast, this light rail plan (and future expansions throughout Austin) removes traffic from roadways by attracting motorists to the transit service, adding the equivalent of four lanes of extra peak capacity to this corridor. Can the same be said for the current $720 million road-focused bond plan? I suggest that urban rail — providing highly attractive rail transit service on its own dedicated tracks — makes far more sense as a solution for alleviating mobility congestion, than simply trying to squeeze more traffic onto the city’s crowded streets, roads, and parking spaces. I’ve heard the argument that urban rail is “not ready” to be offered as a bond measure. Yet polls and other evidence indicate resounding support for public transit and urban rail, and the Austin community has gone through years of repeated outreach exercises familiarizing them with the technology and the issues. The public seems more ready than ever to support rail; it’s Austin’s civic leadership that seems to have cold feet. NOTE: As of this posting, the Mobility Committee and City Council have approved the $720 million roads-dominated bond measure, without provision for transit, as a bundled package. 5.3-mile Minimum Operable Segment light rail line proposed by CACDC. Graphic: Screenshot from CACDC map. An Austin “mobility” bond package without a single major transit project? That’s the current plan from the office of Austin Mayor Steve Adler – a $720 million bond bundle overwhelmingly (about 83%) concentrated on roadway projects, with a smattering of “alternative mobility” pedestrian and bicycle projects, and virtually no significant public transport improvements. 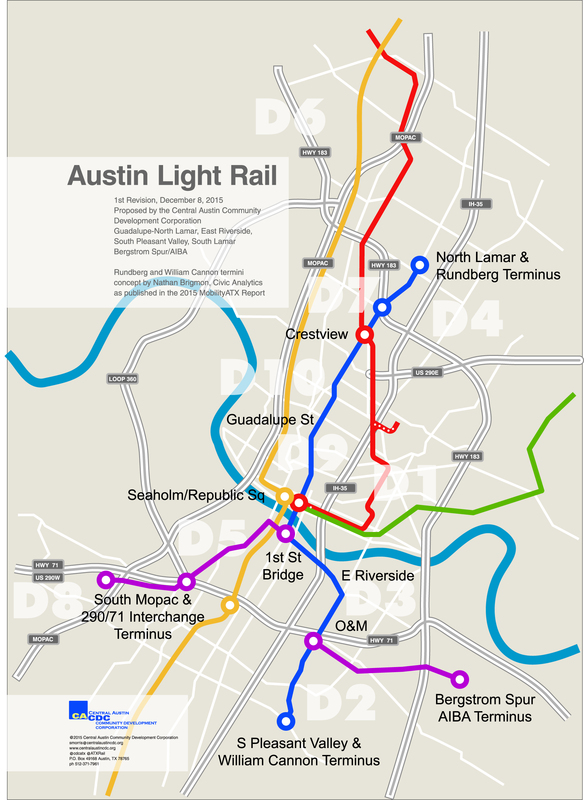 The current official bond package stands in stark contradiction to the decades of official “green” rhetoric verbally embracing public transportation and “high-capacity transit” as key components of the “alternative mobility” measures necessary to “keep Austin moving” – rhetoric also enshrined in major policy initiatives of recent decades such as Envision Central Texas and Imagine Austin. The “mobility” bond package also comes in contrast to a recent resurgence of competent studies and reports suggesting that continuing to emphasize further roadway development – because of effects such as encouraging suburban sprawl, creating further dependency on private car travel, and inducing even more traffic – is a losing game. In response, an outcry has arisen throughout the Austin community, calling for some major public transport elements to be included in the “mobility” bond measure. By far the most substantial alternative approach to the official roadwork-heavy bond offering is a proposal crafted by Scott Morris and Andrew Clements of the Central Austin Community Development Corporation (CACDC), a small nonprofit organization. Supported by a group of other community leaders, the proposal suggests that a light rail transit (LRT) Minimum Operable Segment (MOS) would be feasible, stretching 5.3 miles from Crestview (North Lamar at Airport Blvd.) south to Republic Square (West 4th St.) in downtown Austin (see maps above and further below). CACDC estimates daily ridership of 37,400 for the MOS. 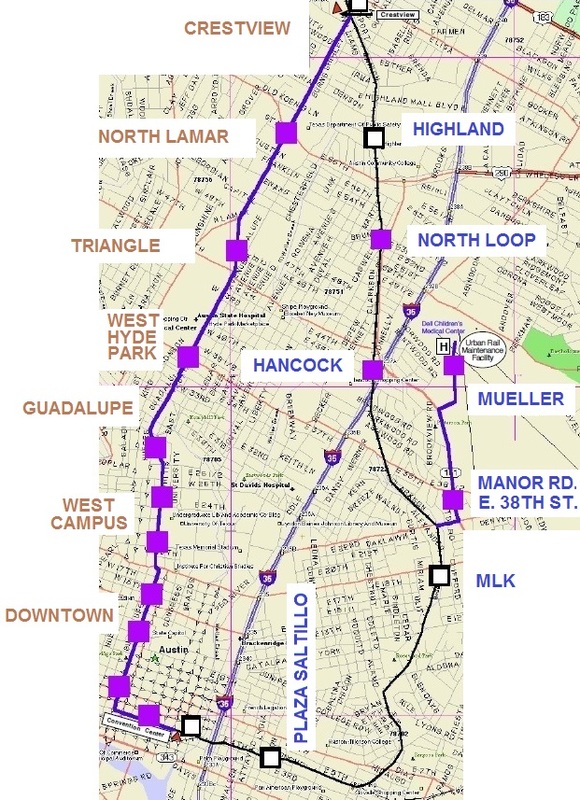 The MOS is actually a subset of previous plans for the Guadalupe-Lamar (G-L) corridor, such as Capital Metro’s 1994 plan, the agency’s 2000 plan, a 2013 proposal from Texas Association for Public Transportation (TAPT), an earlier, more extensive CACDC plan for the G-L corridor, and the 2014 “Plan B” proposal from Austin Rail Now (ARN). In addition to previous design work by Capital Metro consultants from 1994, 2000, and the early 2000s, ARN has also suggested another design option for inserting LRT infrastructure into the corridor. See: «San Francisco’s N-Judah Muni Metro line shows design option for light rail in Austin’s Guadalupe-Lamar corridor». 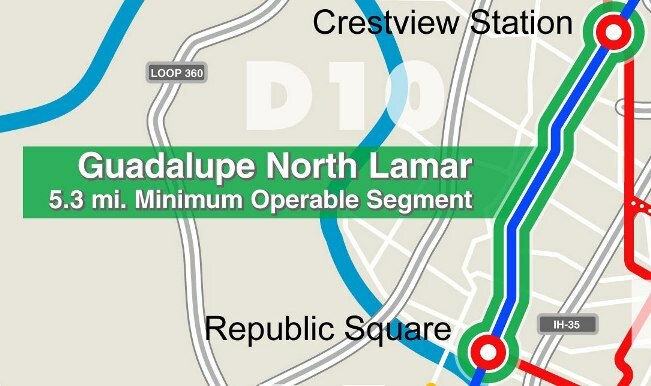 Cross-sectional view of a possible design for LRT in the Guadalupe-Lamar corridor. Graphic: ARN. CACDC’s capital investment cost estimate for the proposed MOS – $397.5 million – is based on an average of costs from 15 rail projects (LRT plus one diesel-powered light railway), as compiled by the Federal Transit Administration (FTA) and reviewed and analyzed by Andrew Clements. This renders an average of $68.3 million per mile (2016 dollars). Especially in light of past studies of LRT in the G-L corridor, as well as recent projects nationwide, the methodology certainly provides a competent and plausible basis for a “system-level” order-of-magnitude estimate suitable for presentation to voters and justification for further, more detailed planning. CACDC is proposing that its year-2016 cost estimate ($397.5 million) be offered to voters in full as a ballot measure this coming November. CACDC believes the MOS project could be implemented via local funding and without assistance from the Federal Transit Administration (FTA). A more methodologically conservative estimate of investment cost for the same proposed MOS by the Light Rail Now Project of Texas Association for Public Transportation (TAPT) accepts CACDC’s cost estimate but adds a higher allowance for contingency. As explained by Lyndon Henry, a transportation planning consultant and technical consultant to the Light Rail Now Project (and also a contributing editor to this website), there is a substantial component of “unknown” in most major rail transit projects. Therefore, best standard practice for capital investment cost estimates is to apply a contingency allowance (for surface LRT projects) averaging at least 25-30% of the total of all other costs – in effect, as a kind of “insurance”. Curiously, a cost estimate of “about $465 Million” reported in a May 12th KEYE-TV News segment covering the CACDC proposal, including an interview with Clements, appeared to incorporate such a contingency, amounting to about 28% added to the cost-per-mile average that Clements found from his analysis of FTA project data. However, the actual project funding intended in a bond measure must also allow for the effects of inflation as the project proceeds. Thus standard practice is to escalate the given current-year investment cost estimate into YOE (year of expenditure) dollars. Otherwise project proponents, designers, and managers will either (a) be caught short or (b) need to go to voters again for enough money (or scrummage for some other source) to actually complete the project. The TAPT estimate assumes a 2.5% adjustment rate over a project span of four years. In TAPT’s assessment, seeking FTA assistance (and thus collaboration and oversight) is important, particularly since TxDOT lacks a strong rail oversight program. The dangers of disdaining federal collaboration already became clear in some of the most serious missteps of Capital Metro’s MetroRail implementation, resulting in a significantly delayed opening, jeopardizing public support, and leading to expensive operational constraints and unexpected requirements, continuing to this day. FTA participation would also imply 50-50 sharing of the capital investment cost, significantly alleviating the funding burden borne by Austin taxpayers. Also, a design concept to implement a cross-platform transfer between LRT and MetroRail (under the aegis of the Federal Railroad Administration, or FRA) would invoke FRA involvement. Based on all these factors, the TAPT capital investment cost estimate, with 28% contingency and YOE escalation at 2.5% per annum, totals about $520 million for this 5.3-mile MOS starter line. In TAPT’s FTA-funded scenario, a mobility bond measure of $260 million would be sufficient to provide a local 50% match for funding the project. 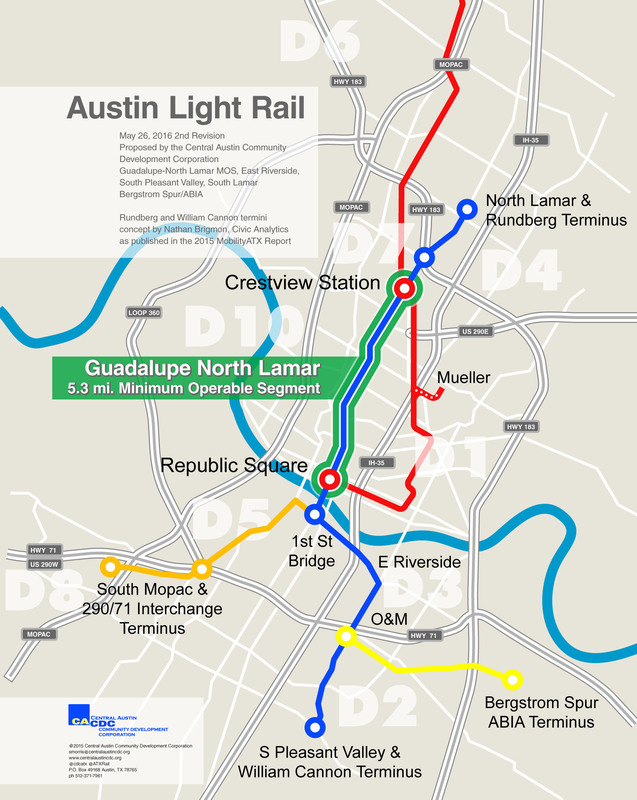 Wider-view map, in context of central-city Austin, showing 5.3-mile LRT MOS route strategically serving busy local Guadalupe-Lamar corridor between Loop 1 (MoPac) and I-35. Graphic: ARN. That differential may seem small, but, compared with buses, LRT brings additional advantages. Passengers have a greater sense of service reliability and safety, and greater orientation to where routes go and where stations are located. There’s a much greater sense of permanence. LRT railcars are more spacious, easier to board and deboard, and more comfortable to ride. Attributes like these combine to attract substantially higher ridership. Based on past ridership estimates for this corridor, including a 2000 New Starts profile study approved by the Federal Transit Administration (FTA), Henry estimates a daily ridership of 30,000 for this MOS (within two years of opening). From the new rider data in the FTA study, Henry extrapolates that approximately 13,800 of these rider-trips would be new to transit in the corridor. By assuming that all these new rider-trips would otherwise be made by motor vehicle, this means that about 12,600 daily vehicle trips would be eliminated from these arterials (in addition to those already diverted to public transit). During peak travel periods, nearly 5,000 private vehicle trips would be eliminated, as former motorists would be attracted to the proposed new light rail service. The road-focused $720 million “mobility” bond package currently under consideration tries to address congestion and safety by increasing “throughput” of vehicles. Unfortunately, experience and a vast body of evidence suggest that this is a losing approach — trying to tweak more capacity to squeeze more traffic typically merely induces more traffic. Furthermore, this influx of ever-growing vehicle traffic simply imposes more stress on congested areas such as Austin’s core. I would suggest that our approach — providing highly attractive rail transit service on its own dedicated tracks — makes far more sense and is far more sustainable as a long-term solution for alleviating mobility congestion, than those elements in the current official proposal that simply attempt to squeeze more traffic onto the city’s crowded streets, roads, and parking spaces. Proposed MOS LRT starter line could serve as anchoring backbone for expansion into LRT network throughout metro area. Map: Andrew Mayer. And those capacity projections are merely predicated on the initial base estimate of 30,000 daily ridership. The actual potential capacity of the line’s infrastructure, with additional railcars and minor upgrades (e.g., increased power supply), could be raised to 9,000 peak-period rider-trips per hour, corresponding to daily ridership of about 90,000. That’s ultimately equivalent to approximately ten freeway lanes (five per direction). Over the past several decades, Austin has acquired notoriety for endless agonizing, hesitation, confusion, and indecision over urban rail. Dozens of “studies, re-studies, and re-studies of the re-studies” (in the words of Lyndon Henry) have been executed for LRT in the Guadalupe-Lamar corridor, with no outcome other than further indecision. Now, in the face of excruciating congestion, and a mounting toll of bloody and fatal accidents, the prospect of a “mobility” bond package is on the table. CACDC’s proposal for a 5.3-mile Minimum Operable Segment (MOS) provides an opening path toward some truly realistic solutions. 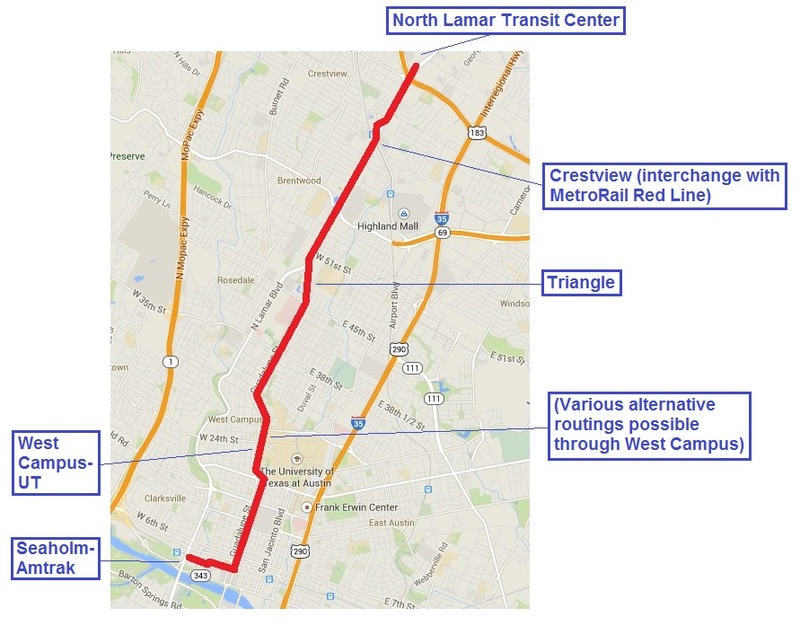 A powerful case can be made that a substantial bond commitment for LRT in the Guadalupe-Lamar corridor can be inserted into the $720 million official “mobility package”. This can be accomplished by reducing some of the proposed roadway expenditures and substituting rail bonding. You are currently browsing the archives for the Guadalupe-Lamar MOS proposal category.